HTC has announced the U12+ and there is a lot to talk about here. If you don’t feel like reading about it, that’s OK, because we have a full video tour of it. If you still want to take in some text, let’s chat. The HTC U12+ is the company’s first big phone of 2018. There are a number of good things going on, but it’s also very much a similar story that HTC has been a part of the past few years. What I mean by that is that HTC has built what appears to be a heck of a phone with all the bells and whistles you can ask for, plus some special HTC sauce in the audio and design departments. Unfortunately, you won’t find it at a carrier in the US, plus it carries a pretty steep price tag for an unlocked phone. You’ll find the full HTC U12+ specs here, but the phone really does have almost everything. From its Snapdragon 845 and big 6-inch QHD+ display to its dual camera setup, 3500mAh battery, 6GB RAM, 64GB or 128GB storage (with SD support), and Android Oreo. It has BoomSound speakers too, as well as IP68 water and dust resistance, and the latest version of HTC’s liquid surface glass design, which includes a clear option (Translucent Blue, seen above). It doesn’t have wireless charging or a headphone jack, though. The U12+ is built like any other premium phone you’ll find with metal and glass everywhere. It has an edge-to-edge display with small bezels without the trendy notch. It’s big, but not necessarily bigger than the OnePlus 6 or Galaxy S9+. It feels pretty nice in hand too. 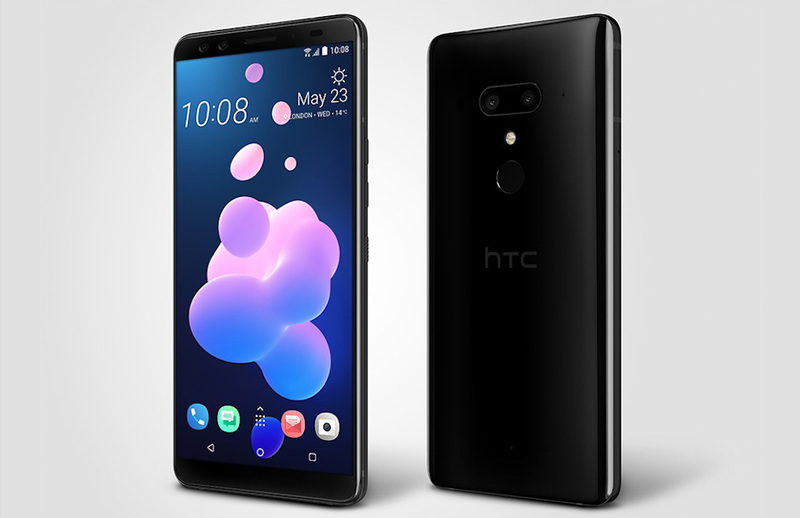 For bonuses, HTC tossed in a new version of Edge Sense, giving you more power when you squeeze the sides of the phone to launch apps or assistants or the camera. You can short or long-squeeze, plus you can now perform a double tap on the phone’s sides. And it’s smart enough to know which hand you are holding it in, so that it can do tricks like hold screen rotation because it recognizes how you are holding it. That new version of its squeezy side tech brought with it pressure sensitive power and volume buttons too. They will take some getting used to, as they aren’t mechanical and are more like Apple’s latest touchpads on Macbooks, but I kind of like the new feel of them. HTC is super excited about the U12+’s dual cameras, thanks to a DxoMark score of 103. While that doesn’t mean a ton to me, it doesn’t shock me that these cameras could be really good. The U11 from last year had one of the best cameras in the business. This new setup of 12MP + 16MP has the features you’ll want, like optical image stabilization and portrait and manual modes, as well as HTC’s zooming audio feature from last year. Again, it’s basically got it all and then some. As for price and availability, this is where things get a bit depressing. The HTC U12+ will go up for pre-order today (May 23) at HTC’s site and through Amazon. You won’t find it at a carrier, but it is certified to work on AT&T, T-Mobile, and Verizon. Sorry, Sprint folks. The US is getting Translucent Blue and Ceramic Black. Translucent Blue will cost $799 for the 64GB version and $849 for the 128GB version. Ceramic Black only comes with 64GB and costs $799. While pre-orders are open today, we don’t yet know when the phone will ship. June is a good guess, though.